In Washington, D.C., U.S. ethanol exports totaled 162.3 million gallons (mg) in April, according to government data released this morning and analyzed by the Renewable Fuels Association. This represents a 25% drop from the near-record export volume recorded in March, but still tallied as the fourth-largest monthly export volume in six years. 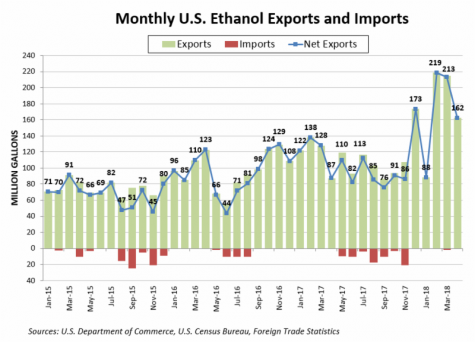 Brazil was the leading destination for U.S. ethanol exports for the sixth straight month, receiving 61.0 mg (38% of total exports), although shipments to the country scaled back by 36% from March. Canada received 27.6 mg of U.S. ethanol in April, up 13% from March and a six-month high (17% market share). U.S. ethanol exports also flourished in several previously tepid markets in April, including Oman (12.6 mg, up 254% from March) and the Netherlands (11.4 mg, up 583%). The U.S. also continued modest export growth in India with a 4% gain over March with 12.3 mg. As predicted, China stepped completely out of the market for the first time in six months, as implementation of the additional 15% import duty shut out U.S. product. Year-to-date exports stood at 684.3 mg through April—44% stronger than the first four months of 2017—implying a record annualized export volume of 2.05 billion gallons.